With an abundance of stunning lights, Oregon Zoo’s ZooLights presents appealing displays of colorful animals, and includes many activities. There are many great photo opportunities, one area being a beautiful Christmas Tree. Through November 21st, to January 6th (not including November 22nd, December 24th-25th), Zoolights is open, 5 to 9 PM. Oregon Zoo provides several discounts.There are several Value Nights, and on the website, they specify which days have deducted costs. Admission on Value Night for Adults(Ages 12-65) is $12.95, while full price Zoolight days are $17.95. Though cheaper, it lasts for an hour less, as it goes 5-8 PM. “Zoolights is so pretty and such a fun place to walk through with your friends and to take pictures!” Freshman Briann Heatherington told me. Another place to visit during winter break is Pittock Mansion. It is a mansion known to house Henry Pittock, the previous owner of newspaper The Oregonian. During the December holidays, the mansion has Christmas themed rooms that carry beautiful Christmas lights strung around, and a decorated Christmas tree. Not only is the inside gorgeous, but from the mansion, it overviews the city of Portland, the Willamette River, and in the distance, the Cascade Mountains. Admission costs $9 for Youth (Ages 6-18), and stays open the entire year except January, Thanksgiving, and Christmas. 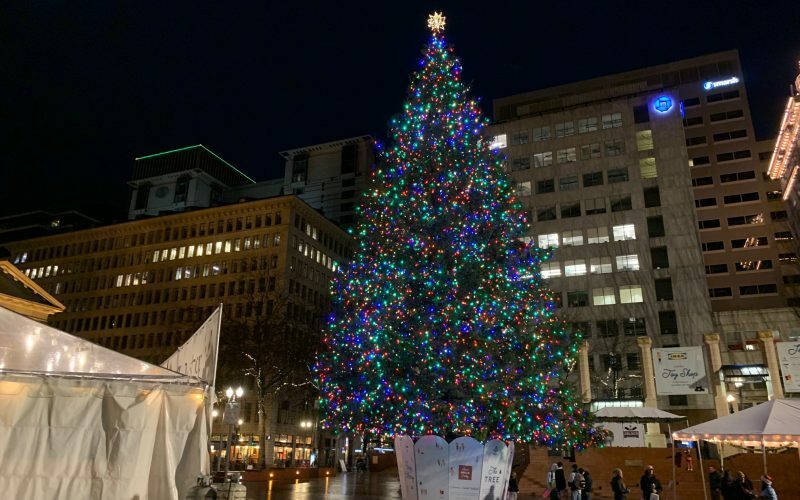 Towering Portland’s Pioneer Courthouse Square, a huge tree is set up to celebrate Christmas. Through December 3rd to December 22nd, free events are operated such as choirs and concerts, to build the sense of holiday spirit. But you don’t need to go outside to enjoy Christmas. There’s selections of beloved movie classics that can be watched at home such as Home Alone, Miracle on 34th Street, and Elf. And with the recent release of The Grinch 2018, both retakes on the 1996 and 2000’s movie How the Grinch Stole Christmas, it adds on to the holiday atmosphere. “[I love] The Nightmare before Christmas. I have lots of childhood memories associated with it. It’s always been my favorite, it’s an overall really cute and sweet movie and it’s really loveable. I watch it every year on Christmas Eve with my cousins or by myself, as a tradition. I just really love the movie,” Freshman Arianna Avalos Rivera expressed her love for the classic Tim Burton movie. Winter Break is a wonderful time where you can enjoy Christmas, New Years, or any holiday you celebrate. It’s an excellent chance to catch up and spend time with relatives you never get to see, and friends you don’t have classes with.